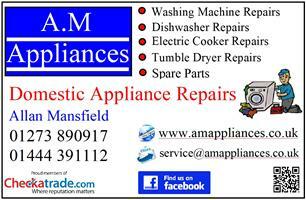 AM Appliances Limited - Appliance Services/Repair based in Burgess Hill, West Sussex. Invoice history based on 763 reviews. Based in Burgess Hill, West Sussex, (01273 890917), (01444 391112) domestic appliance repairs with over 20 years experience. Former Hotpoint/Indesit senior technician, fully trained at the Hotpoint training centre to repair all models of washing machines, tumble dryers, dishwashers and electric cookers. We now cover Crawley, West Sussex. Most makes of appliances repaired with some exceptions. I carry a large amount of stock on the van as I endeavour to repair your appliance on the first visit.